It is quite possible that with the loyal support of the crown and a reasonable patriotism on the part of the nobility, the National Assembly, in spite of its noisy galleries, its Rousseauism, and its inexperience, might have blundered through to a stable form of parliamentary government for France. In Mirabeau it had a statesman with clear ideas of the needs of the time; he knew the strength and the defects of the British system, and apparently he had set himself to establish in France a parallel political organization upon a wider, more honest franchise. He had, it is true, indulged in a sort of Ruritanian flirtation with the queen, seen her secretly, pronounced her very solemnly the «only man» about the king, and made rather a fool of himself in that matter, but his schemes were drawn upon a much larger scale than the scale of the back stairs of the Tuileries. By his death in 1791 France certainly lost one of her most constructive statesmen, and the National Assembly its last chance of any co-operation with the king. When there is a court there is usually a conspiracy, and royalist schemes and royalist mischief making were the last straw in the balance against the National Assembly. The royalists did not care for Mirabeau, they did not care for France; they wanted to be back in their lost paradise of privilege, haughtiness, and limitless expenditure, and it seemed to them that if only they could make the government of the National Assembly impossible, then by a sort of miracle the dry bones of the ancient regime would live again. They had no sense of the other possibility, the gulf of the republican extremists, that yawned at their feet. The king surrendered without a struggle. The little party was taken into the house of some village functionary. «Well», said the king, «here you have me!» Also he remarked that he was hungry. At dinner be commended the wine, «quite excellent wine». What the queen said is not recorded. There were royalist troops at hand, but they attempted no rescue. The tocsin began to ring, and the village «illuminated itself», to guard against surprise… . It was only after this foolish exploit that the idea of a republic took hold of the French mind. Before this flight to Varennes there was no doubt much abstract republican sentiment, but there was scarcely any expressed disposition to abolish monarchy in France. Even in July, a month after the flight, a great meeting in the Champ de Mars, supporting a petition for the dethronement of the king, was dispersed by the authorities, and many people were killed. But such displays of firmness could not prevent the lesson of that flight soaking into men’s minds. Just as in England in the days of Charles I, so now in France men realized that the king could not be, trusted-he was dangerous. The Jacobins grew rapidly in strength. Their leaders, Robespierre, Danton, Marat, who had hitherto been figured as impossible extremists, began to dominate French affairs. These Jacobins were the equivalents of the American radicals, men with untrammeled advanced ideas. Their strength lay in the fact that they were unencumbered and downright. They were poor men with nothing to lose. The party of moderation, of compromise with the relies of the old order, was led by such men of established position as General Lafayette, the general who had represented France in America, and Mirabeau, an aristocrat who, was ready to model himself on the rich and influential aristocrats of England. But Robespierre was a needy but clever young lawyer from Arras, whose most precious possession was his faith in Rousseau; Danton was a scarcely more wealthy barrister in Paris, a big, gesticulating, rhetorical figure; Marat was an older man, a Swiss of very great scientific distinction, but equally unembarrassed by possessions. On Marat’s scientific, standing it is necessary to lay stress because there is a sort of fashion among English writers to misrepresent the leaders of great revolutionary movements as ignorant men. This gives a false view of the mental processes of revolution; and it is the task of the historian to correct it. Marat, we find, was conversant with English, Spanish, German, and Italian; he had spent several years in England, he was made an honorary M.D. of St. Andrew’s, and had published some valuable contributions to medical science in English, Both Benjamin Franklin and Goethe were greatly interested in his work in physics. This is the man who is called by Carlyle «rabid dog», «atrocious», «squalid», and «Dog-leech» -last by way of tribute to his science. The revolution called Marat to politics, and his earliest contributions to the great discussion were fine and sane. There was a prevalent delusion in France that England was a land of liberty. His Tableau des vices de la constitution d’Angleterre showed the realities of the English position. His last years were maddened by an almost intolerable skin disease which he caught while hiding in the sewers of Paris to escape the consequences of his denunciation of the king as a traitor after the flight to Varennes. Only by sitting in a hot bath could he collect his mind to write. He had been treated hardly and suffered, and he became hard; nevertheless, he stands out in history as a man of rare, unblemished honesty. His poverty seems particularly to have provoked the scorn of Carlyle. «What a road he has travelled; and sits now, about halfpast seven of the clock, stewing in slipper-bath; sore afflicted; ill of Revolution Fever … Excessively sick and worn, poor man: with precisely eleven pence halfpenny of ready-money, in paper; with slipper-bath; strong three-footed stool for writing on, the while: and a squalid Washerwoman for his sole household … that is his civic establishment in Medical-School Street; thither and not elsewhere has his road led him… . Hark, a rap again! A musical woman’s voice, refusing to be rejected: it is the Citoyenne who would do France a service. Marat, recognizing from within, cries, Admit her. Charlotte Corday is admitted». Such was the quality of most of the leaders of the Jacobin party. They were men of no property-untethered men. They were more dissociated and more elemental, therefore, than any other party; and they were ready to push the ideas of freedom and equality to a logical extremity. Their standards of patriotic virtue were high and harsh. There was something inhuman even in their humanitarian zeal. They saw without humour the disposition of the moderates to ease things down, to keep the common folk just a little needy and respectful, and royalty (and men of substance) just a little respected. They were blinded by the formulae of Rousseauism to the historical truth that man is by nature oppressor and oppressed, and that it is only slowly by law, education, and the spirit of love in the world that men can be made happy and free. And while in America the, formulae of eighteenth-century democracy were on the whole stimulating and helpful because it was already a land of open-air practical equality so far as white men were concerned, in France these formulae made a very heady and dangerous mixture for the town populations, because considerable parts of the towns of France were slums full of dispossessed, demoralized, degraded, and bitter-spirited people, The Parisian crowd was in a particularly desperate and dangerous state, because the industries of Paris had been largely luxury industries, and much of her employment parasitic on the weaknesses and vices of fashionable life. Now the fashionable world had gone over the frontier, travellers were restricted, business disordered, and the city full of unemployed and angry people. But the royalists, instead of realizing the significance of these Jacobins, with their dangerous integrity and their dangerous grip upon the imagination of the mob, had the conceit to think they could make tools of them. The time for the replacement of the National Assembly under the new-made constitution by the «Legislative Assembly» was drawing near; and when the Jacobins, with the idea of breaking up the moderates, proposed to make the members of the National Assembly ineligible for the Legislative Assembly, the royalists supported them with great glee, and carried the proposal. They perceived that the Legislative Assembly, so clipped of all experience, must certainly be a politically incompetent body. They would «extract good from the excess of evil», and presently France would fall back helpless into the hands of her legitimate masters. So they thought. And the royalists did more than this. They backed the election of a Jacobin as Mayor of Paris. It was about as clever as if a man brought home a hungry tiger to convince his wife of her need of him. There stood another body ready at hand with which these royalists did not reckon, far better equipped than the court to step in and take the place of an ineffective Legislative Assembly, and that was the strongly Jacobin Commune of Paris installed at the Hotel de Ville. So far France had been at peace. None of her neighbours had attacked her, because she appeared to be weakening herself by her internal dissensions. It was Poland that suffered by the distraction of France. But there seemed no reason why they should not insult and threaten her, and prepare the way for a later partition at their convenience. At Pillnitz, in 1791, the King of Prussia and the Emperor of Austria met, and issued a declaration that the restoration of order and monarchy in France was a matter of interest to all sovereigns. And an army of emigres, French nobles and gentlemen, an army largely of officers, was allowed to accumulate close to the frontier. It was France that declared war against Austria. The motives of those who supported this step were conflicting. Many republicans wanted it because they wished to see the kindred people of Belgium ‘liberated from the Austrian yoke. Many royalists wanted it because they saw in war a possibility of restoring the prestige of the crown. If Marat opposed it bitterly in his paper L’Ami du Peuple, because he did not want to see republican enthusiasm turned into war fever. His instinct warned him of Napoleon. On April 20th, 1792, the king came down to the Assembly and proposed war amidst great applause. The war began disastrously. Three French armies entered Belgium two were badly beaten, and the third, under Lafayette, retreated. Then Prussia declared war in support of Austria, and the allied forces, under the Duke of Brunswick, prepared to invade France. The duke issued one of the most foolish proclamations in history; he was, he said, invading France to restore the royal authority. Any further indignity shown the king he threatened to visit upon the Assembly and Paris with «military execution». This was surely enough to, make the most royalist Frenchman a -republican-at least for the duration of the war. The new phase of revolution, the Jacobin revolution, was the direct outcome of this proclamation. It made the Legislative Assembly, in which orderly republicans (Girondins) and royalists prevailed, it made the government which had put down that republican meeting in the Champ de Mars and hunted Marat into the sewers, impossible. The insurgents gathered at the Hôtel de Ville, and on the tenth of August the Commune launched an attack on the palace of the Tuileries. The Assembly had no stomach to back the government’s action of July in the Champ, de Mars. The fierce vigour of the Commune dominated it. The king found no comfort whatever in the Assembly. It scolded him and discussed his «suspension». The Swiss fought until they received a message from the ‘king to desist, and then -the crowd being savagely angry at the needless bloodshed and out of control- they were for the most part massacred. The long and tedious attempt to «Merovingianize» Louis, to make an honest crowned republican out of a dull and inadaptable absolute monarch; was now drawing to its tragic close, The Commune of Paris was practically in control of France. The Legislative Assembly -which had apparently undergone a change of heart- decreed that the king was suspended from his office, confined him in the Temple, replaced him by an executive commission, and summoned a National Convention to frame a new constitution. The tension of patriotic and republican France was now becoming intolerable. Such armies as she had were rolling back helplessly towards Paris. Longwy had fallen, the great fortress of Verdun followed, and nothing seemed likely to stop the march of the allies upon the capital. The sense of royalist treachery rose to panic cruelty. At any rate the royalists had to be silenced and stilled and seared out of sight. The Commune set itself to hunt out every royalist that could be found, until the prisons of Paris were full. Marat saw the danger of a massacre. Before it was too late he tried to secure the establishment of emergency tribunals to filter the innocent from, the guilty in this miscellaneous collection of schemers, suspects, and harmless gentlefolk. He was disregarded, and early in September the inevitable massacre occurred. 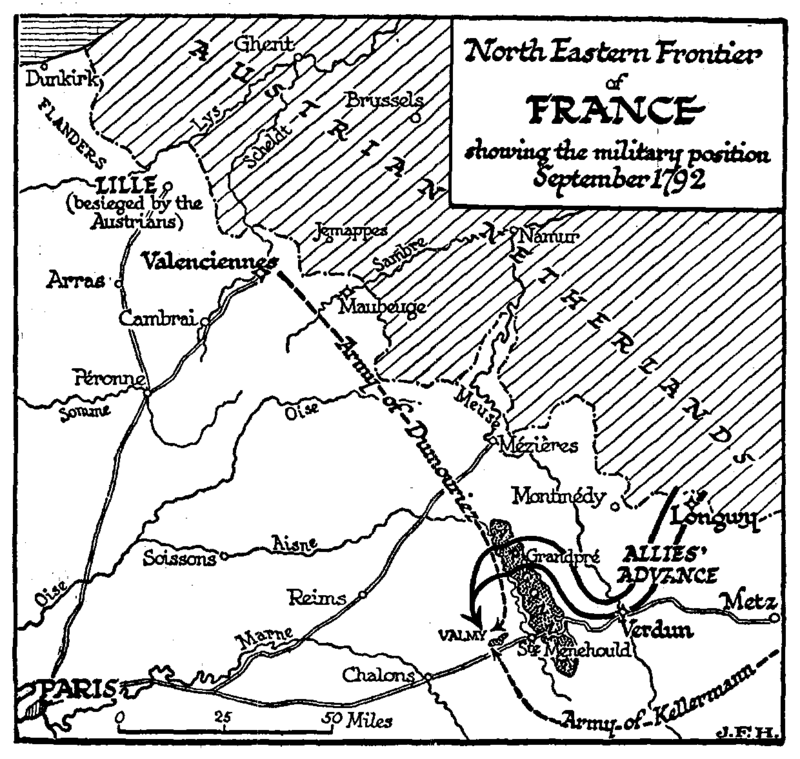 Map of the north eastern frontier of France, showing the military position September 1792. Suddenly, first at one prison and then at others, bands of insurgents took possession. A sort of rough court was constituted, and outside gathered a wild mob armed with sabres, pikes, and axes. One by one the prisoners, men and women alike, were led out from their cells, questioned briefly, pardoned with the cry of «Vive a Nation», or thrust out to the mob at the gates. There the crowd jostled and fought to get a slash or thrust at a victim. The condemned were stabbed, backed, and beaten to death, their heads hewn off, stuck on pikes, and carried about the town, their torn bodies thrust aside. Among others, the Princesse de Lamballe, whom the king and queen had left behind in the Tuileries, perished. Her head was carried on a pike to the Temple for the queen to see. In the queen’s cell were two National Guards. One would have had her look out and see this grisly sight. The other, in pity, would not let her do so. Even as this red tragedy was going on in Paris, the French general, Dumouriez, who had rushed an army from Flanders into the forests of the Argonne, was holding up the advance of the allies beyond Verdun. On September 20th occurred a battle, mainly an artillery encounter, at Valmy. A not very resolute Prussian advance was checked, the French infantry stood firm, their artillery was better than the allied artillery, For ten days after this repulse the Duke of Brunswick hesitated, and then be began to fall back towards the Rhine. This battle at Valmy -it was little more than a cannonade- was one of the decisive battles in the world’s history. The Revolution was saved. The National Convention met on September 21st, 1792, and immediately proclaimed a republic. The trial and execution of the king followed with a sort of logical necessity upon these things. He died rather as a symbol than as a man. There was nothing else to be done with him; poor man, he cumbered the earth. France could not let him go to hearten the emigrants, could not keep him harmless at home; his existence threatened her. Marat had urged this trial relentlessly, yet with that acid clearness of his he would not have the king charged with any offence committed before he signed the constitution, because before then he was a real monarch, super-legal, and so incapable of being illegal. Nor would Marat permit attacks upon the king’s counsel … Throughout Marat played a bitter and yet often a just part; he was a great man, a fine intelligence, in a skin of fire; wrung with that organic hate in the blood that is not a product of the mind but of the body. Louis was beheaded in January, 1793. He was guillotined for since the previous August the guillotine had been in use as the official instrument in French executions.